Over the last few months Your Mama has typed our fingers to the nubs writing about this poor gurl and her real estate shenanigans. And here we go again. Now that Brit Brit is out of rehab and the dee-vorce deets have been mostly finalized, this chaotic couple have gotten serious about selling off their marital house of horrors up in Malee-boo's Serra Retreat. Reports say Federline is due half the proceeds from the sale of this house, so you know the white rapper called up listing agent Kimberley Pfeiffer at Coldwell Banker and told her to "sell the damn house lickety split 'cause yo yo yo needs a new pair of sneakers and a trip to Vegas." No babies, the white rapper didn't actually say that, but we like to think he said something along those lines. One of our Malee-boo real estate snitches told us he thinks the property is a very difficult sell because of all the taint surrounding it. Looks like he might be right from the humongous price chop late this week. The couple first priced their former love shack at $13,500,00 and have now slashed the priced by $1,500,000 and one dollar to $11,999,999. Still no photos of the interior of the house, which Your Mama is told has a country-fied shabby chic sort of thing going on. We have also heard that Brit Brit has her wedding dress mounted and standing up in the corner of her bedroom, which we find strange and upsetting. As we mentioned in our post earlier today, it appears that Brit Brit has taken the Bev Hills house that she purchased in December of 2006 off the market. We don't imagine the peripatetic, addled and bald Brit Brit intends to keep the house up in The Summit, but she does need someplace to stash the children until she buys something else. Clearly she's happy to shack up in a hotel, on some stranger's floor in Burbank, or in the back seat of her Mercedes. But the children and their army of nannies need a place to chill, change diapers, and potty train. We keep hearing rumors about her moving back to Louisiana or even back to New York. But somehow we find that unlikely. If Your Mama was placing bets, we'd say odds are she's staying in LA or moving to some other club heavy location like Miami or Las Vegas. Seriously Your Mama hopes the princess of Promises learned something during her time up in the hills of Malee-boo drying out. We could care less if she makes another record, we're not a fan. But we don't want to see the gurl go down like this and sincerely hope she gets her act together for herself and those innocent babies. We also would like some peace in our lives and wish she would just buy a damn house and settle down for a few years. 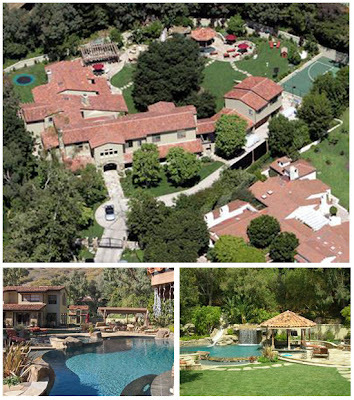 given that britney is worth about $250mil, i am left to wonder why she doesn't just buy a couple or three nice houses around the country for a total of about $50mil and invest the rest. the standard formula is that you can spend 4% a year and keep up with inflation. mama, she would have $8mil/yr pre-tax! who could'nt live on that and just relax? she could have a whole fleet of them little cadillac CTS's that you like so well. truly, it's not like she blows that much on under things! I think the price chop happened because the maids cannot get the Funyon crumbs out of the carpet.